Are these topics important in SL? Ask most club owners if politics or religion are a welcomed topic of conversation and you will most likely hear that no, they are not. Why is that? Perhaps because not only do people have their own beliefs and views on both, but both are hot button issues for that very reason. Religious at all. Some people could care less about politics. even have a place in Second Life. To me SL is an escape, a place to be whatever and whoever I may want be and to do things I enjoy. I like to live a little more on the wild side of things in my second life. I can have jobs I'd never do or cannot do in RL. I don't think about RL things like religion and politics while inworld. Politics and /or religion. And that's not to say that some may even seek out religion in-world. life. For others there are far more controversial views and beliefs they give importance to within SL. 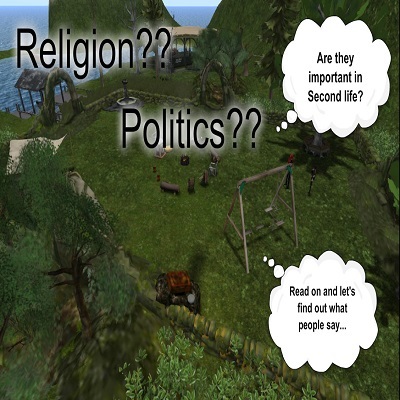 Becca Drascol: Are Politics and Religion important topics in SL? NeaFarspire Resident: I suppose it can be but from experience, those two topics still get heated even on SL. I try to stay away from discussing both...smiles. Becca Drascol: Ok can I ask why you feel they are not? BarricWolf Resident: I do not come here for it. BarricWolf Resident: I come here to do the things I can not in real. BarricWolf Resident: I can talk Politics and religion in real. Becca Drascol: Great Thank you. Well thought out answer. EvanDarkblood Resident: Don`t get me wrong a person can be political or religious all they want. That being said I am neither and feel that there is no place for them in SL and with all the differing views on both they just cause drama. LaceyNightshade Resident: No they aren’t religion and politics have there place but it isn’t within SL. I feel people are too passionate about both and it’s just an issue waiting to happen when you incorporate either here. Nicholle Inglewood: I don't think those topics are important unless you’re in some type of political or religious group. To me they shouldn't be discussed because from previous experiences, it just causes everyone to fight lol. 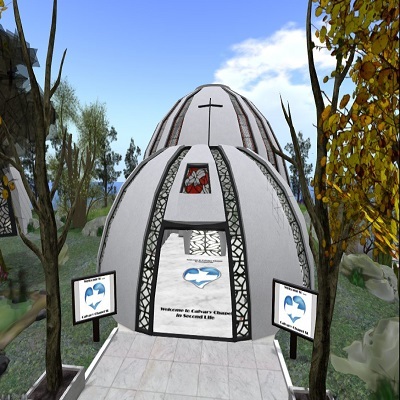 For some religion and politics hold their place within Second life. For if they did not, churches and other religious venues I visited would not exist and have traffic as high as four thousand. Or places for deep discussions on these very topics but also on such things as atheism. I do believe even in SL that people will discuss hard hitting issues and they will discuss ones that some people wouldn’t touch with a ten foot pole. However, for those I interviewed Religion and Politics were not something they wish to include virtually. Are these topics important to you? Comment and let us know how you feel.